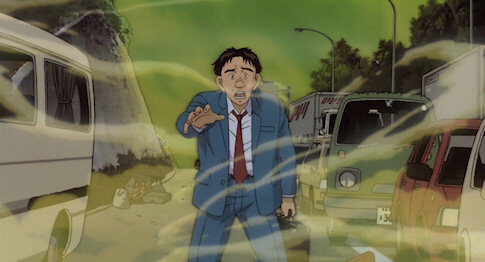 Seven years after ‘Akira‘, Katsuhiro Otomo returned to the animated screen with ‘Memories’, a package film, which impresses, but fails to reach the heights of ‘Akira’. 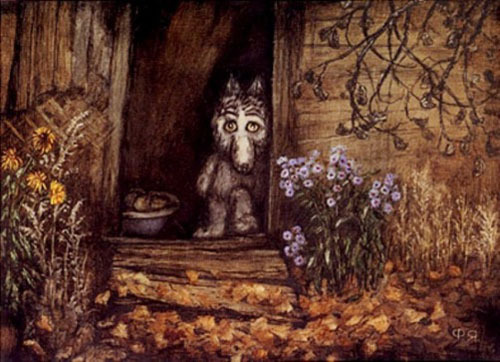 Based on his own short stories, ‘Memories’ consists of three unrelated parts: Magnetic Rose, Stink Bomb and Cannon Fodder, which are discussed separately below. ‘Magnetic Rose’ starts the Memories trilogy, and it’s arguably the feature’s most satisfying episode. It is the only part that clearly deals with memories (screenplay writer Satoshi Kon’s favorite future subject). In this episode a rescuing squad of space garbage collectors is ensnared in the memories of a long deceased opera singer, who still seems alive in her remote satellite home in space, blurring the boundaries of reality. Even though the science fiction setting with its touches of horror is typical anime, the underlying drama is very mature and quite unique. This episode’s screenplay was penned by future director Satoshi Kon. Kon certainly established himself with this screenplay, and he would further explore the theme of memory and loss in ‘Millennium Actress’ (2001), and the blurring of reality and fantasy in both that film and ‘Paprika’ (2006) with even more spectacular results. Director Kôji Morimoto, meanwhile, would prove his worth in ‘Beyond’, the best episode of ‘The Animatrix‘ (2003). 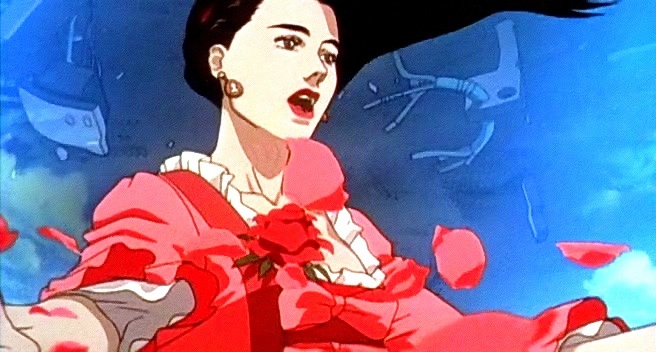 In ‘Magnetic Rose’ the characters are from all over the world, and this is one of the few anime, in which the Japanese character looks distinctively Asian compared to the European characters. ‘Stink Bomb’ feels like a comical interlude between the two more serious outer episodes. The story is set in present day Japan and features a very stupid, but surprisingly indestructible protagonist who turns into a nonsensical lethal weapon. The story is simple: our ‘hero’ accidently swallows the wrong pills, wich turn him into a lethal weapon, sweating poisonous gasses that kill everything in sight. Although he remains unaware of this, he becomes the cause of the destruction of Japan. This story is rather silly, and there’s a lot of broad comic acting, but the short also has some disturbing undertones, with the fear of mass destruction weapons and corrupt governments played out well. 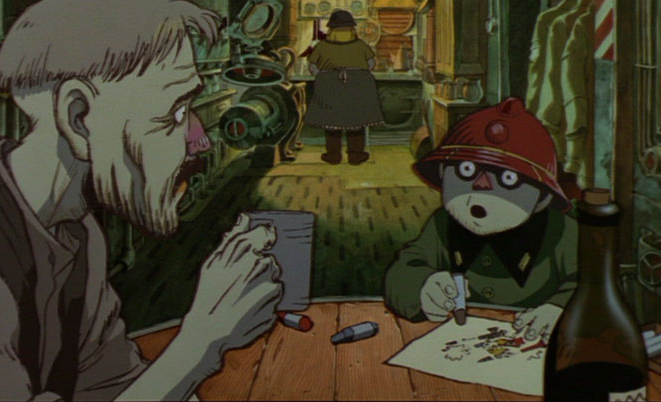 Otomo himself directed the last and most beautiful sequence of Memories. This episode has an original graphic style that doesn’t resemble any other anime. The film is ‘shot’ in one long camera take (with a little bit of smuggling, but very impressive nonetheless) and deals with an alternative, distinctively European, world where a totalitarian military regime enters every aspect of life. In this sequence we’re following a single family. They live in a city were all work and school is directed to the war with a mysterious and unseen moving city. This war is fought entirely by using cannons. Despite the caricatured humans, the atmosphere is hardly comical, but dark and disturbing. However, the drama is less engaging than in ‘Magnetic Rose’. Nonetheless, because of its unique style, and strict control of cinematography, ‘Cannon Fodder’ is a small masterpiece.